Sons of Silence Motorcycle Club (SOSMC) is a one-percenter motorcycle club that was founded in Niwot, Colorado in the United States in 1966. The first chapter outside Colorado was the Iowa chapter which was founded in 1968. There are now American chapters in Arkansas, Colorado, Florida, Idaho, Illinois, Indiana, Kansas, Kentucky, Louisiana, Minnesota, Mississippi, Missouri, North Dakota, South Dakota, Utah and Wyoming. The first foreign chapter was founded in Munich, Germany in 1998. In 2001, more German chapters were founded in Freising, Gangkofen and Nürnberg where they temporarily called themselves CEC or 353 (coming propably Central European Criminals) which changed soon back to the original SOS at some point In November 2007, when also Viernheim did get their own chapter, soon after all chapters promised loyalty by original chapters. The Sons of Silence's logo is copied from the Budweiser logo an American eagle superimposed over the letter "A" (similar to, and taken from, the Anheuser-Busch logo) flying under an arch and their motto is "donec mors non separat ", Latin for "until death separates us". The logo is a patch that is sewn on the back of each full member's vests, along with assorted other badges. 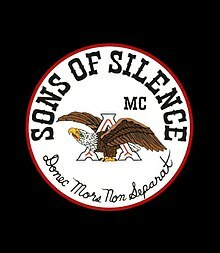 ^ "Sons Of Silence Mc". Sonsofsilence.com. Retrieved 2012-02-25. ^ "Sons of Silence web site". Sonsofsilence.com. Retrieved 2011-07-05. This page was last edited on 12 April 2019, at 03:13 (UTC).